Skateboarding is the new form of transportation and recreation for people of all ages. This one-of-a-kind skateboard security rack provides a safe location for skateboards wherever they need to be stored. 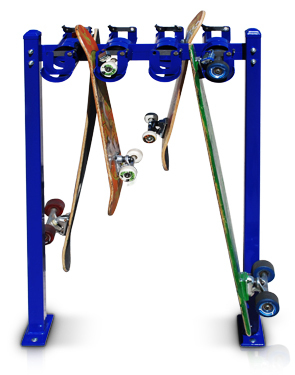 Whether it's a skate park, store front or school, this skateboard security rack will provide convenient and safe storage for skateboard riders both young and old. 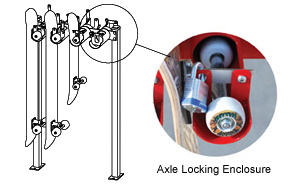 Both the single and double sided skateboard security racks come in a surface and in-ground mount. 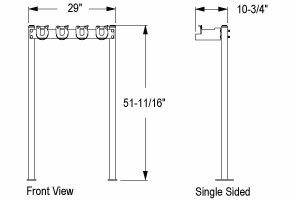 To maximize skateboard parking, optional rails are available to connect 2, 3 or 4 surface mount racks to store up to 32 skateboards.